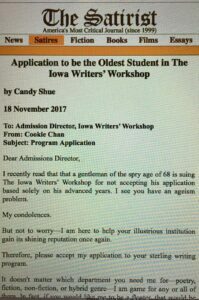 I have my MFA in Poetry from the University of San Francisco, but when I heard that The Iowa Writers’ Workshop was being sued for age discrimination, I knew I had to help them out. So I applied to be their Oldest Student–and the resulting article was published in The Satirist. Now I just have to wait for my acceptance from Iowa’s Admissions Director, right? This entry was posted in Essay, Humor and tagged article, Dan Geddes, humor, satire, The Satirist by Candy Shue. Bookmark the permalink.